At Royal Home Improvement, we want you to save both money and energy! That’s why we manufacture, install and guarantee our windows and other products! When looking for quality service, choose a company that is backed with years of experience. Our team is dependable and devoted to serving customers with complete respect and courtesy. You’re going to like the way we do business! 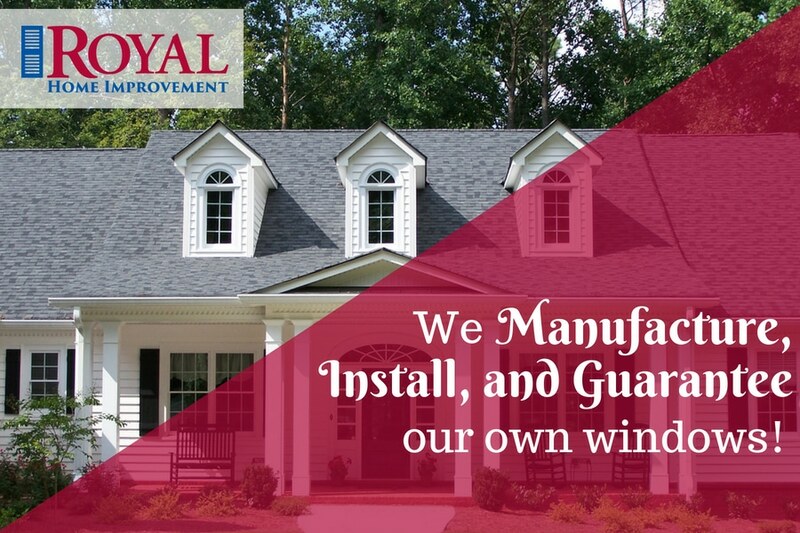 Whether you’re looking to improve your home, reduce energy costs or increase the resale value, you can be sure you’re in good hands with Royal Home Improvement. Royal Home Improvement is the only CertainTeed Five Star dealer in the state. CertainTeed is North America’s leading brand of interior and exterior building products. Our windows are manufactured right here in an Arkansas factory. Whatever your budget may be, we’ve got the right windows for your home. Our energy-efficient ThermoKing Windows are the highest quality replacement product on the market. You can trust ThermoKing Windows to be ready for all seasons since they’re built to keep out heat in the summer and cold in the winter. You’ll see the difference in your utility bills. Our windows feature custom-made glass that reduces the amount of heat transfer, keeps your carpet from fading, and keeps your home comfortable. We have custom colors available, and if we don’t have the exact color, we can make it for you! Not every window replacement is the same. Royal believes in providing high-quality home products at honest prices. Our windows are Energy Star Approved, have earned the Good Housekeeping Seal, and you can get peace of mind with our Assurance Plus Warranty. Our awning windows open and close with an easy to operate hand crank. They are hung on the wall at the top of the window and open outward, making them easy to clean. Various colors, glass and grid options are available. Our bay and bow windows expand interior space and add dimension to any room. You can add a cozy reading nook or a perfect spot for a dining room. They are custom-made to give your home a new look. Our casement windows open up like a book and use a hand crank for easy opening and closing. The window sash opens so windows can be easily cleaned from the inside. They also come with a multipoint locking system for ultimate security. These windows contain three layers of weather stripping to keep air and moisture. The top-rated hardware system allows any size casement window to be easily operated. Royal uses a ¾” insulating glass to provide optimal energy efficiency. The InnovativE® high-performance glass uses Low-E coating specifically engineered for local requirements. Double hung windows work by sliding the top and bottom frame up and down. They also tilt in for easy cleaning. These work in almost any home and provide durability, efficiency and beauty. They can be custom fit to any size opening. PVC framing acts as a natural insulator and a sloped sill stops air and moisture from penetrating. Single hung windows are popular with many homeowners due to their affordability, ease of operation and energy efficiency. These windows allow more light into the room with a top pane that has a larger area for glass. Sliding windows roll on a rail system with one fixed pane and one sliding pane. The rail and cam lock action sashes proved extra security. They are made with heavy-duty PVC framing that is a natural insulator. Fin-Seal weather stripping on the window sill prevents moisture and air infiltration. The InnovativE® high-performance glass with Low-E coating is specifically engineered for local requirements. From beginning to end, specialists at Royal Home Improvement will be there for every step of the installation process. We know you need a company you can trust for any home improvement project. All of our installers are factory-trained and passionate about their job. Our project managers oversee every installation to ensure everything runs smoothly and our team works closely with homeowners to accommodate their needs. If you are having a door or window installed, we make certain that every opening is filled before the work day is over. We assure you that your home will be secure at all times and that all material debris is cleaned up every day. Every window we install is custom-built in our own factory and numbered for future reference should it ever need service. Our team will demonstrate how to operate and the clean windows before finishing up. We can fully back our products because they are made right here in Arkansas! We have received the Guildmaster Award for GuildQuality for 2018! That means in our first year of partnership with GuildQuality (https://www.guildquality.com/guildmaster), our customers repeatedly awarded us the highest possible ranking and we got a recommendation rate of 90 percent or above from our customers surveyed by GuildQuality. Royal is well-known for our integrity, superior products and reasonable prices. And, all of our products are manufactured, installed and guaranteed by us! We know our customers expect amazing service, assistance and communication, and we do our best to deliver! You may have heard the saying, “you get what you pay for”, but with Royal Home Improvement, you actually get more! From windows, to roofing, siding, sunrooms and screen rooms, to multi-family properties, we are the company you can trust!